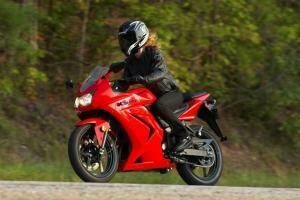 There are many different reasons to start your motorcycle riding career on a smaller bike. You may not have considered something in a 250cc class before, but by the end of this article you will have a few really solid reasons to consider them for your first motorbike. 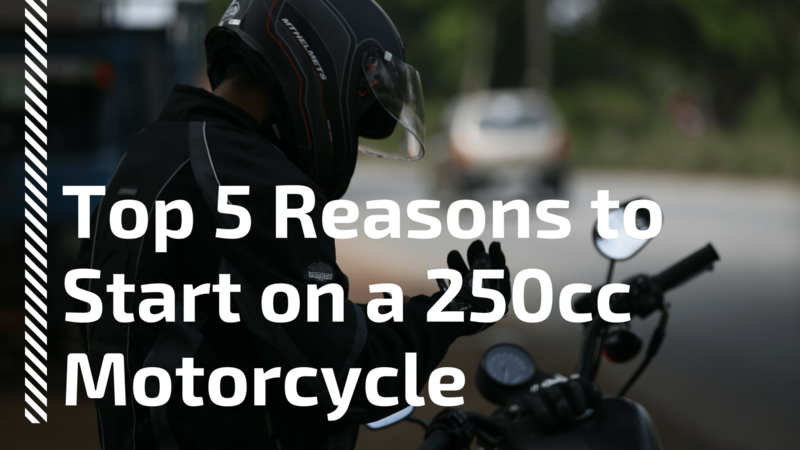 Here are few of the BEST reasons that may convince you to pick up that 250cc motorcycle. Riding a motorcycle is hard for most people. Sure, put someone on a motorcycle for a few months or a year and it will eventually become second nature. Until you build the muscle memory that you need to properly operate a bike, you need to stack as much in your favor as you can. 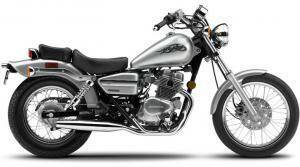 One of the easiest ways to do that is by choosing a 250 as a first motorcycle. With a 250 you don’t have to worry too much about twisting the throttle and pulling a power wheelie (although I have seen it done by a pro 250 rider at the track). With a 600 it is quite easy to reach 40 or 50 miles per hour in first gear with just a twist of the wrist, add into that target fixation and you soon become a human missile headed for an oncoming car. When you take the power out of the equation you can build a solid foundation of skills that you can transfer to a larger motorcycle later. 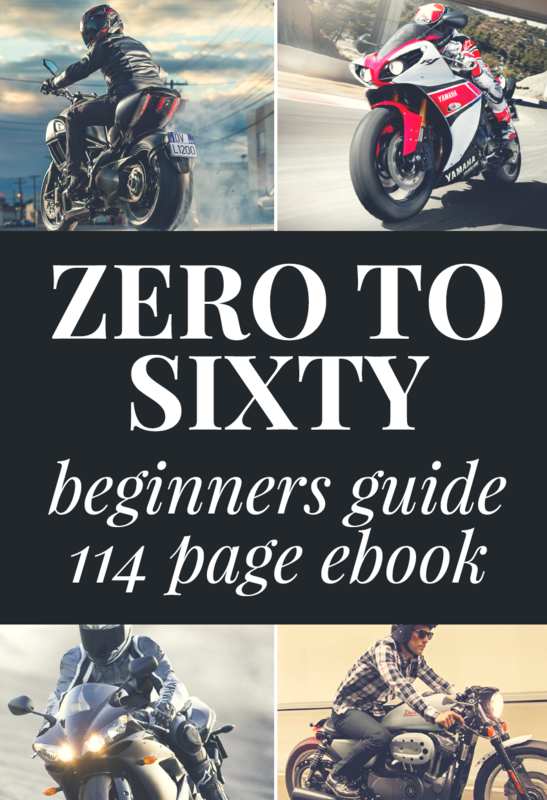 You learn to shift properly, carry your speed into turns, look where you want to go etc… All of it is achievable on a larger motorcycle, but you can learn it quicker and more efficiently on a 250cc. 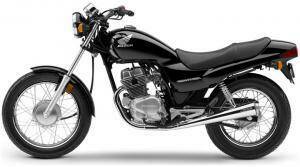 You can pick up a brand new Kawasaki Ninja 250 for under $3,500 (maybe a few hundred dollars more or less depending on the dealer), or a 2008 Honda Rebel for about $3,200. By contrast an 08 Kawasaki Ninja ZX-6R is over $9,000 brand new! That’s a lot of moola to spend on a bike that you are most likely going to drop at least once during your first year of riding. 250’s generally get twice or three times the miles per gallon (MPG) that their larger counterparts do. A smaller engine means less gas is needed to get you where you are going. Add to that the fact that they are usually at least a hundred pounds lighter than a 600 and its going to increase that MPG even further. If you insure your motorcycle (which is the law in California and most states) then you will also notice a pleasant surprise if you own a 250 versus a 600. You can also get some pretty amazing machines so you’re not short on choice when you go a little smaller (check out our Top Starter Motorcycles post for proof that small is beautiful). Small motorcycles are more inexpensive in every department, plus when you are done with them you can get almost all of your money back when you sell (especially if you buy them used first). One of the great things about these motorcycles is they really hold their resale value. Tons of new people are getting into motorcycles ever year, and that means a lot of beginner riders that want to buy their first bike. The most sought after motorcycle is of course the 600, and the market is literally flooded with them from new riders who buy them and try to sell them less than a year later because they either crashed, or they found out the hobby wasn’t for them. A lot less people buy 250’s for their first bike, but because of the internet the idea of starting on a smaller bike is gaining ground. There is a short supply of 250’s and a much greater demand for them, this keeps their resale value extremely high. Check your local craigslist.com and you will see hundreds of advertisements for 600cc bikes, but when you check for 250’s they are few and far between. Bookmark a few of the 600 ads and check them again in a week and you will notice that a lot of them are still there. 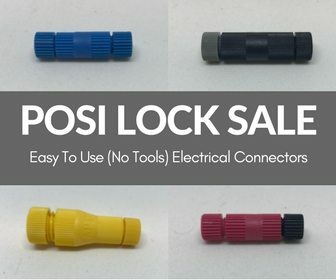 If you do the same thing with a few of the advertisements selling 250’s you will notice that most if not all of them will have been sold already. This is how it is in the California Bay Area, so I would imagine it would be the same in most other parts of the country with a thriving motorcycle community. Yes, the 08 Ninja is a great reason to start on a 250 motorcycle. Simply put this bike looks better than some of the 600cc, or 1000cc bikes I have seen! I realize that some people out there might like the ‘dated’ look of the 2007 models and earlier, but I think those folks are crazy. It’s taken the Kawasaki engineers nearly 2 decades to come out with a new version of the 250 and this one takes the cake. This is probably one of the only times in the last 10 years where people are buying a 250cc bike for the looks, and not for the practicality. The new version of Kawasaki’s famous ninjette is also quite a bit more powerful than its predecessors. Most riders feel like they are riding a bike with at least 100 more CC’s than they actually are. 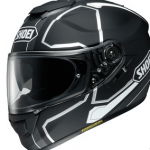 This is great because it will make the transition to a 500cc or 600cc bike that much easier if you choose to do so. Honestly for the price, and for the looks, this is one bike that makes being a beginner motorcycle rider really cool. Ask anyone with a Yamaha r1 if they have ridden their bike to its limits on the street. If they answer yes, they are lying, unless you happen to be talking to a corpse. The same can almost be said for most 600cc inline-fours as there are very few people that have the balls or the skill to ride a bike that that to its limits on public roads. The reason being is because once you have enough experience to actually take a bike to its limits, you are generally not dumb enough to do so in an area with cars coming the other direction. The 250cc bike though is a different story. Most of them top out before they reach 100mph which means you won’t be smoking any lambo’s on the freeway. This makes the ideal terrain for the beginner bike the twisty roads often found in the hills on the outskirts of town.Here you can lean the bike over, crack open the throttle, and carry your speed into turns a lot easier than with a 600cc bike. For the ninja 250 you’ll be shifting out of first before you even hit 20mph, the same cannot be said for its big brother the Kawasaki ZX-6R. While riding the 250 you’ll have much more of a racer feel because you will be shifting more to keep the bike in the ideal power range. To get the same feeling with a 600cc bike you would have to be going two to three times the speed. 250 bikes are small, and that is a blessing in California! As far as I know we are the only state which allows lane sharing or ‘lane splitting’. This means motorcycles can actually ride on the dotted white line that separates the lanes and which allows them to ride through standstill traffic. This is a blessing since it is quite easy for a motorcycle to overheat, especially during California summers. It also helps with traffic congestion because it allows one less vehicle to add to the large line of slowly moving cars. The tricky thing about lane sharing though is you don’t want to hit other cars, especially their mirrors that are sticking out. 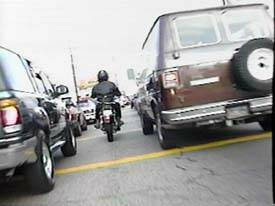 It’s much easier to avoid doing this if you have a small, narrow framed motorcycle like the Honda Rebel or Ninja 250. I’ve seen riders on big BMW’s and Harleys with saddlebags try and lane split before, but they either go extremely slow to avoid hitting anything, or they don’t even bother splitting at all. When you ride a ninja 250 in traffic the bike is so skinny that it feels like you have a full lane in between the cars!